ANTI-BULLYING AND SELF DEFENCE SEMINAR FOR CHILDREN IN MANCHESTER 2ND SEPTEMBER! A MASSIVE CONGRATULATIONS TO BILLY DENIZ AND CONNOR PRIDDING FOR BOTH COMPETING IN MUAY THAI SHOW RAW & READY THIS PAST WEEKEND. BILLY DENIZ DEFEATED CHARLIE FENN IN AN AWESOME SHOW OF TECHNICAL SKILL AND PRESSURE FIGHTING AND CONTINUES UNBEATEN. CONNOR PRIDDING HAD A GREAT OUTING, ESPECIALLY CONSIDERING IT WAS HIS FIRST FIGHT BUT CAME UP SHORT AGAINST OPPONENT DAH LANGDEN BUT DISPLAYED SOME AWESOME COUNTER STRIKING AND WAS IN IT UNTIL THE VERY END. A BIG SHOUT TO HEAD HONCHO KARL MCVETY FOR GETTING THESE BOYS FIGHT READY DRAWING ON OVER 30 YEARS MARTIAL ARTS EXPERIENCE OF BOTH TEACHING AND FIGHTING. SKILL, FITNESS, RESPECT AND DISCIPLINE HAS BEEN TAUGHT AND UTILISED. IF YOU WOULD LIKE TO PARTICIPATE IN A SIMILAR COMPETITION THEN THE ONLY WAY TO START IS TO DO JUST THAT AND COME DOWN TO KMMA TO ONE OF THE VARIOUS CLASSES OFFERED. EVERYONE FROM THE CLUB WOULD LIKE TO EXPRESS THEIR RESPECT AND CONGRATULATIONS TO THESE TWO WARRIORS. BILLY DENIZ WINS FIRST AMATEUR MUAY THAI FIGHT! A big congratulations to Billy The Kid Dynamite!! Bagging his first win at Raw & Ready Muay Thai! GOLD AT THE EURO CHAMPIONSHIPS FOR BILLY DENIZ!! HOURS AND HOURS AT THE GYM HARNESSING HIS NATURAL TALENT HAVE COME GOOD FOR LONG TIME STUDENT BILLY DENIZ. BILLY PROVED THAT DEDICATION AND HARD WORK PRODUCES RESULTS LIKE THIS - GOLD. Build confidence and fitness by enrolling in our all ladies Krav Seminar. Learn to defend yourself in any situation. Contact Karl now on 07961 914 054 to book a place! 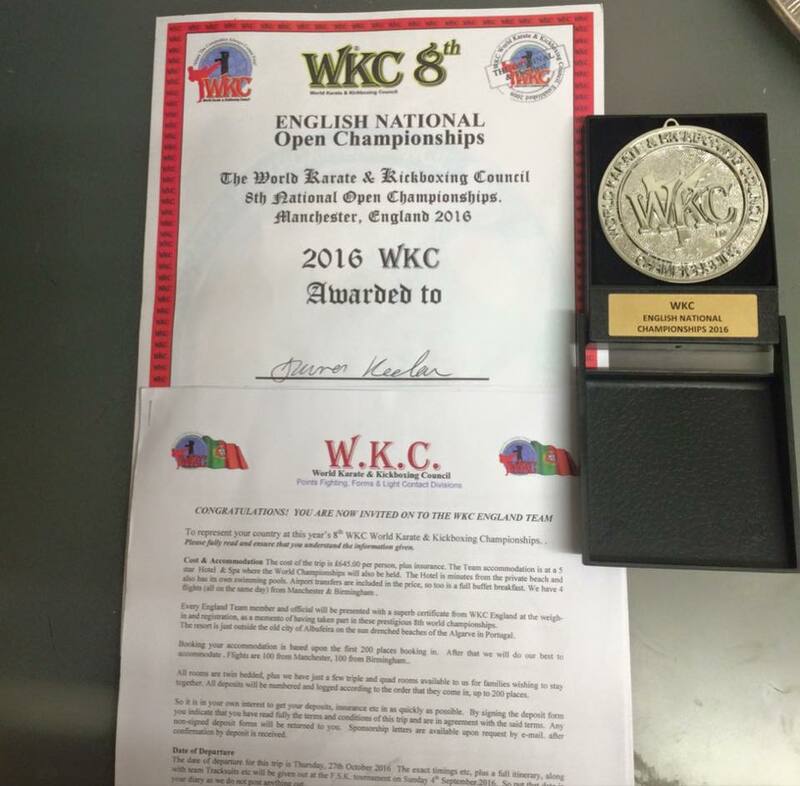 WKC ANOTHER GREAT SUCCESS FOR THE KMMA CRU! Both senior and junior students went out and fought in the true spirit of Martial Arts pulling home 2 bronze medals and 1 silver medal at the first WKC open of this year. Some tough contests were had and we'll all be back at the next event this summer!! Another year rolls into place and another competition is here. Get your cardio and technique on point and get prepared at one of the many classes we offer here at KMMA. Junior and senior light contact and point fighting. The recent all ladies Krav Session went off with a boom! Helped along by Chris McDonald, Luke McDonald, Muckta McVety, Debbie Stevenson and Karl McVety there was expertise a plenty. The students got down and dirty drilling throwing techniques, chokes, strikes, weapon disarm and group attack. Be sure to get yourself on the next ladies! Well done to all the lads from KMMA in capturing medals at the recent WKC open - Billy Deniz, Darren Keelan and Darryl Rees. K.M.M.A Freestle Martial Arts Group is based in Manchester, Tameside Stockport and Oldham. We teach We specialise in teaching people of all ages from children (6yrs) to adults. Our highly experienced instructors have been taught to an exceptional level. All instructors are C.R.B. registered, first aid qualified and are black belt qualified as standard and above. All K.M.M.A. Instructors are still continuing their Martial Arts education to keep uptoÂ date with new and modern techniques. During the daytime we concentrate on Primary and Secondary schools based in the Manchester , Tameside and Oldham areas and we are currently expanding to new schools on a weekly basis. Evening time is dedicated to both children and adults alike in various venues. We are both registered and affiliated with the W.K.A. (World Kickboxing Association UK).